I can’t believe it is December and the start of Advent. As I write, a gentle warm rain is falling and thunder is rumbling in the distance, a sure sign that winter is on its way. It’s been a long hot summer, and the rains came late this year. Even now, the temperatures in Tiberias are often in the mid-20s, and the sun shines most days. As we wait and watch for the coming of Christ’s light at Christmas, I have been thinking back on the past year and calling to mind the places of darkness where we so need the light of hope, peace, joy, and love to shine. Sadly, one of the themes that has run through much of the partner work I’ve been doing this year has been around gender-based violence. Twenty-four women have been killed in acts of gender-based violence in Israel this year, and domestic abuse is rising across Israel and Palestine, but particularly in the Ultra-Orthodox Jewish and Arab communities, and most especially in Gaza. Only a couple of weeks ago, two young women were murdered in northern and central Israel. Thousands of women marched in Tel Aviv to mark the International Day for the Elimination of Violence Against Women on 25 November, and yesterday, tens of thousands of women across Israel were striking in protest of the government’s seeming complacency towards violence against women. Funding of 250 million shekels was allocated by government ministries last year for programmes to reduce domestic violence and provide support for women who were victims, but only a fraction of that funding has been released. Over 300 municipalities, institutions, and schools supported the strike. 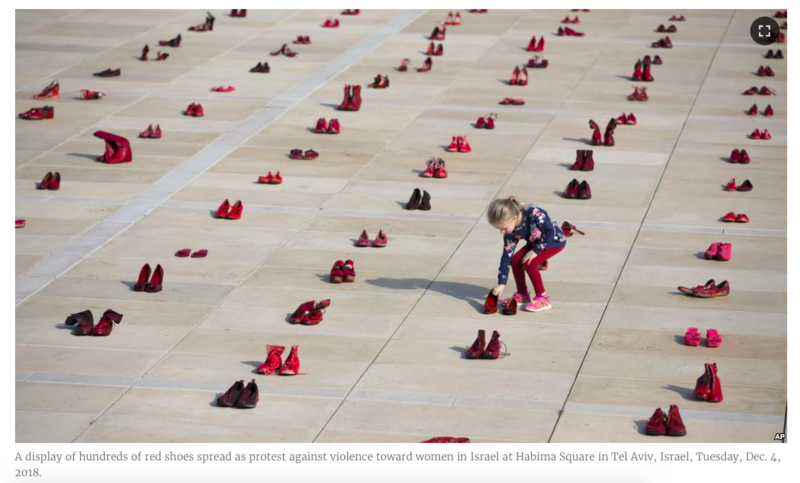 On Monday, residents of Haifa, Jerusalem and Tel Aviv woke to see the water of their cities’ fountains died deep red, symbolising the blood of abused and murdered women. Here at the Scots Hotel, we have a notice on the tv in the staff dining room, in Hebrew and Arabic, stating the management’s support for the strike, its condemnation of all acts of violence, and numbers of domestic violence hotlines. Monday morning, I dropped by Sindyanna of Galilee, one of our partner organisations here in the north. 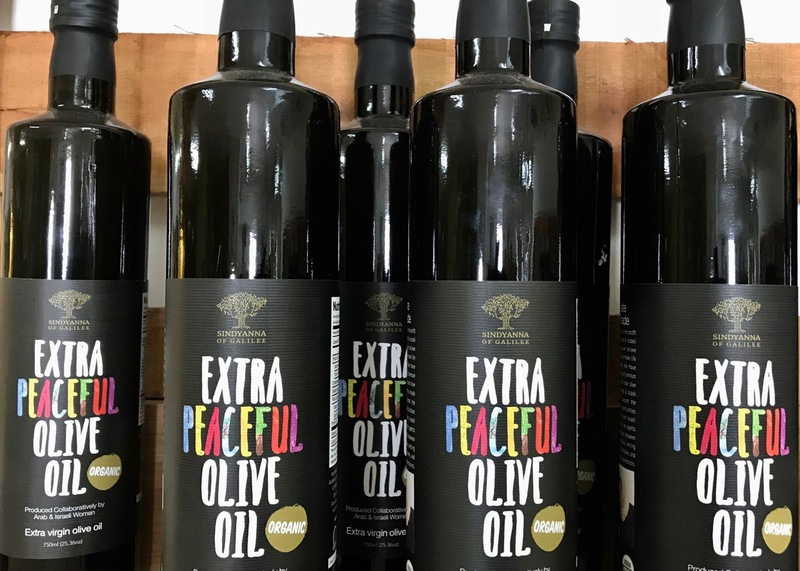 They produce fair-trade olive oil, supporting Arab olive farmers in the Galilee, whilst providing employment opportunities for Arab women and cultural activities which bring women from Arab and Jewish communities together for dialogue. They were planning to close an hour early yesterday in order to hold a workshop on domestic violence, educating the women about their rights, and providing them with information on women’s crisis centres in the area. Also in my thoughts at this time is Al-Tufula, another NGO in Nazareth that specialises in child development and women’s empowerment within the Arab-Palestinian community in Israel. Its director Nabila Espanioly works in coalition with a number of other NGOs (both Jewish and Arab) in a broad range of local and international advocacy campaigns. Often, when Israel presents a report to the UN on women’s rights, it focuses on the Jewish women of the country, so she is involved in presenting a shadow report to reflect the experiences of Arab women. Arabs make up 20% of the population of Israel, but 50% of the women murdered in Israel are from the Arab community. And of course, there are the women of Gaza, and the steep rise in gender-based violence and domestic abuse there, which I have previously written about after our last visit. The start of Advent marks the start of my fourth year here (which is hard to believe!). And as I learn more about the complexities of the context, I become ever more convinced that we as a Church cannot talk about liberation for one group of people without working together to liberate all people. We cannot point our finger at the injustices of occupation if we don’t also address the other forms of oppression and objectification we see around us. I know this makes for pretty grim reading. But this is what is on my mind as we light our Advent candles symbolising hope, peace, joy, and love each Sunday at St Andrew’s. I watch the dancing flames and I think of the promise of the words from John’s gospel: ‘The light shines in the darkness, and the darkness did not overcome it.’ This year, I am lighting candles not only in the dark, but as an act of protest against the darkness that is in our world. As I do, I pray for those who live daily with the threat of violence, those suffering from the trauma of past abuse, those who have died at the hands of family members. And I also pray for those who bring hope, peace, joy, and love into their communities, those who strive for justice, those who show compassion, those through whom Christ’s light shines in the darkness. 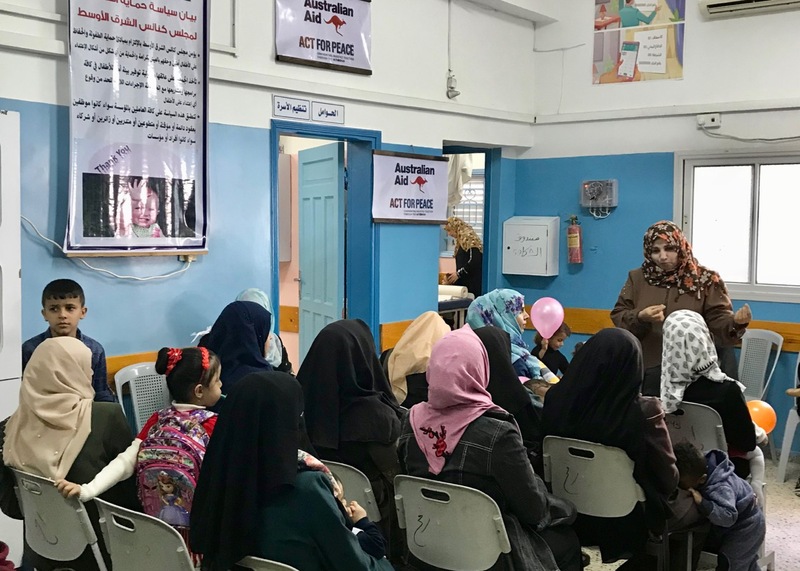 There are so many like the women at Sindyanna, Al-Tufula and the women’s programmes in Gaza whose work makes a real difference in this land of the Holy One. Friends, in this season when our hearts turn towards Bethlehem, please remember the women who live and work here. I wish you all a blessed Advent season, a joyful Christmas, and a New Year filled with renewed hope. * This is an extract from the letter I wrote to the presbyteries in Scotland with whom I am partnered. Thanks as always for this post. You are much missed in Edinburgh but it’s good to share even a glimpse of what you are doing.